Ivory Coast and Japan face off in a World Cup 2014 Group C match. So far, Ivory Coast is leading 2-1. Gervinho’s goal puts Ivory Coast 2-1 ahead. Bony equalizes for Ivory Coast. It’s 1-1 and game on. Honda opens scoring for Japan in the first half. Here is an AP article on the match. RECIFE, Brazil (AP) — Didier Drogba, the Toure brothers and Didier Zokora are the best players left from the generation that made Ivory Coast relevant in world football nearly a decade ago. This World Cup may be the last chance they get to make history for their nation. Individually, the stars of “Les Elephants,” as they’re known in their French-speaking African nation, have flourished for their professional club teams. Drogba was among the most dangerous strikers in the English Premier League with Chelsea for much of the past decade. Yaya Toure is coming off a 20-goal, championship-winning campaign with Manchester City. His brother, Kolo, spent last season on the back line of Liverpool, the team that narrowly trailed Manchester City in the standings. Zokora has played in both the Premier League with Tottenham Hotspur and Spain’s La Liga with Seville. Yet, when they’ve come together to represent their nation on the biggest stages, they’ve left disappointed. They never managed to win the Africa Cup of Nations — which Ivory Coast has won only in 1992 — despite being among the favorites, losing twice in the championship game. Now comes their third straight World Cup, and what on paper, at least, looks like their best chance to advance past the group stage for the first time. After Japan, they will round out group play against Colombia and then Greece. While those teams are no pushovers, they don’t pose the challenge Ivory Coast faced in 2006, when its group included Argentina and the Netherlands, or in 2010, when the team was matched with Brazil and Portugal. Zokora was quick to point that out Friday. “In 2014, at least, the group is worse, which is good for us,” he said. There were concerns leading up to the opener that Ivory Coast would not be at full strength. Toure has been trying to work his way back from a hamstring pull, while Drogba, now with Turkish club Galatasary, was seen limping off the practice field Wednesday. 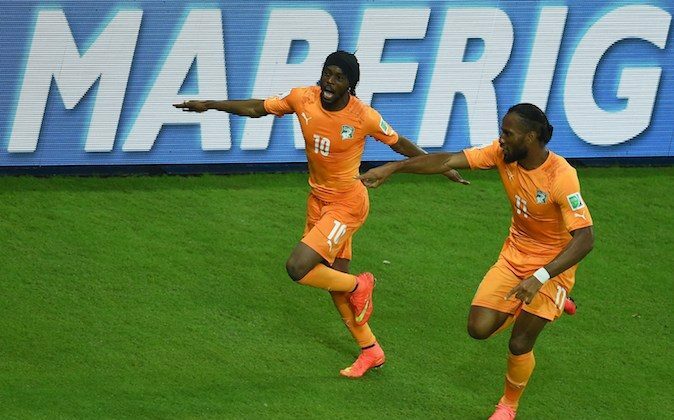 If they are fit, the 31-year-old Yaya Toure and 36-year-old Drogba — the country’s all-time scoring leader with 64 goals — could shine in the group stage. The same goes for the defensive-minded Kolo Toure and Zokora, who are both 33. For Lamouchi, a 42-year-old former French player who was hired in 2012, the challenge is ensuring his players are motivated by memories of past disappointments, rather than tensing up under the pressure of trying to finally fulfill expectations on the world stage. He starts by stressing the positive. “I must recognize that I am very lucky because this is my first (international coaching) experience and I am in charge of leading the Elephants in the World Cup,” Lamouchi said. “This is a real privilege. Zokora, whose 119 international appearances are the most of any of his teammates, said he expects the veterans’ past experiences on the world stage to help them, not haunt them. “I feel reassured — we are a lot stronger compared to the first World Cup in 2006,” he said. “We are more mature as well. And to be able to play a World Cup in Brazil, it’s a real dream. We’ve done a lot together.